It’s not every day you get to meet a professional freestlye footballer. 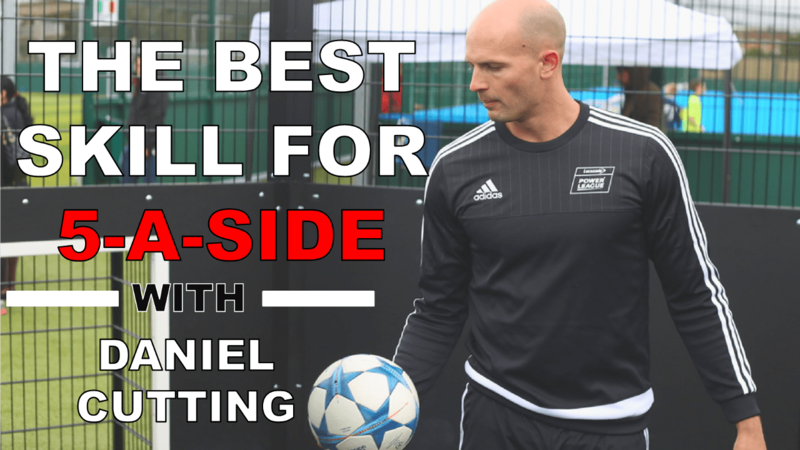 So when I met Daniel Cutting, I had a lot of burning questions to ask him. Not least, whether he can teach me a 5-a-side skill. Daniel has been a professional freestlyer for a long time now, having established himself as a man with serious skills with a ball. Not only has he appeared in videos for some of the biggest corporate brands out there, his freestlying skills have also seen him become a five-time world record holder. But what can a top freestlyer teach me? Daniel’s signature move is a keepy-uppy-catch-and-backflip. It features in the video below, and it’s a mighty impressive display of ball control and athleticism. When you see it live, as I did, you can’t help but applaud. They’ve got a point. Even if you could backflip like he can, with the ball wedged between your legs, you’re unlikely to want to find yourself trying to execute it in a game of 5-a-side. Impressive as it might be, it’s not really the sort of move you’re going to bank on to beat a player. So I asked him for something more reasonable. More dependable. A 5-a-side skill you can bank on. And, without hesitation, what he gave us was the flip-flap. Otherwise known as ‘the Elastico’ this move was made famous twice in the 11-a-side game. First it was used by the Brazilian, Rivelino, in the 1970s. Then decades later in the 2000s, Ronaldinho brought it back and absolutely terrorised defenders with it. There’s videos of them both at the bottom of the page, for your viewing pleasure. Both of them proved one thing: done right, this move really works. And if you’ve heard me harp on about the truth about skills for football, you’ll know how much I value a skill that actually works. Essentially, the flip flap involves pushing the ball with the outside of your foot away, out to the side of your body. Then, as the defender begins making his move off in the direction you’ve pushed the ball, you quickly move your foot around the ball and drag it back across your body and go the other way. It’s worth re-emphasising Daniel’s advice. When you’re starting out learning this skill don’t expect to be doing huge wide flip-flaps like you’ve seen Ronaldiho do. No, when you’re just starting out, you need to start small and concentrate on getting your technique right. Then, as you get the hang of it, you can start improving the move and pushing the ball further. When you’re ready for the advanced level, check out below how Ronaldinho does it – notice how he really exaggerates the first push of the ball away from his body, which is the key to unbalancing the defender. Nearly 40 years before Ronaldinho, the great Rivelinho had already mesmerised defenders with the elastico. In fact, it’s claimed that he invented the move. That’s debatable, but he was certainly the first to popularise it. What’s even more impressive is that Rivelinho played at a time where players weren’t afforded the protection that referees give them today. This was a time when defenders took no prisoners, and referees barely flinched when defenders lunged in wildly at attacking players. The fact that Rivelinho was pioneering such an audacious skill in an era like that earns double the man-points. Even attempting a move like this, when faced with a spring-loaded defensive mercenary, deserves a particular pat on the back. Even within twenty seconds of the video below starting, two tackles come in on Rivelinho which – in today’s game – would be considered nothing short of criminal. The joy of Rivelinho is that he made a mockery out of them – it’s pure composure.